“Toki wo Kakeru Shojo” is a juvenile novel written by Tsutsui Yasutaka. It became TV drama, movie, and Manga several times. However, this is the first time to become anime. The main character, Konno Makoto, is brighter and more easygoing than any other characters in movie or TV drama made before. At once she knows she acquires the power of “time leap”. She uses it without hesitation to satisfy her own desire. In 2006 the film won the Best Animated Film in the Sitges Film Festival. In 2007 it won the Animation of the Year during the Japan Academy Prize. Also during the Tokyo Anime Awards it won the Animation of the Year and the Best Original Story/Work. The staff that worked for the film won the Director Award, the Script-writing Award, the Achievement in Art Direction and the Character Design Award. It won the Animation Grand Award, given to the year's most entertaining animated film, at the prestigious sixty-first Annual Mainichi Film Awards. It received the Grand Prize in the animation division at the 2006 Japan Media Arts Festival. The film won the Special Distinction for Feature Film at France's thirty-first Annecy International Animated Film Festival on June 16, 2007. If you suddenly gained the ability to quite literally leap through time, what would you use it for? The sheer fun of it? Getting better grades? Or something else? What if you merely wanted the present to continue; to still live out those memorable days with your friends, playing around and having fun; rejecting the future and not wanting things to change? In Toki wo Kakeru Shojo, a girl is presented with this exact possibility. She suddenly finds out that she has been granted the ability to travel through time, and uses this ability for the purposes mentioned above. At first she tries to correct all the mistakes she made that same day she got the ability; from preventing making a mess out of things in cooking class to dodging people being hurled towards her. And before soon, she tries to keep the times from changing, undoing love confessions and other events which can change her and her two friends' lives. However, everything has a consequence. Even the seemingly most insignificant and puerile of acts can have grave consequences, as such acts are often made out of ignorance or selfishness; both which are traits that rarely bring out a good result if actions are based on them. Our heroine has to learn this the hard way, as she sees how fateful her so-called insignificant acts are, and how wrong she is in her childish beliefs. What she want is merely to keep the fun times around; with her and her two beloved friends. She wants time to stop, to remain in the present. However, time is inexorable; the future is relentlessly closing in on us. And she has to learn this the hard way. But she learns. Through hardships, through death, and most important of all, through love, she learns that the future is not something to be avoided. Rather it is something to be cherished; something one should embrace. And that is the basics of the plot and characters in this story; a girl who repeatedly travels back in time to keep the times as they are, and actually learns during this process that it is better to look forward and into the future rather than intransigently dwell on the present. Her two friends aren't focused on that much, but both are portrayed beautifully when they are, both the though-shelled Chiaki and the obliging Kousuke. Accompanying the beautiful plot is a standard-fare movie animation; which means beautiful and detailed landscapes, cityscapes and backgrounds. And while character movements are fluid, the designs themselves are a bit lackluster, and should have been more detailed. The soundtrack which follows on top is equally beautiful, with serene piano tracks accompanying the at times laughter-provoking and at times melancholy story, and a somewhat expected, yet beautiful ending theme. Toki wo Kakeru Shojo is a beautiful movie, which is good for many things, but especially its underlying hints about looking towards the future and accepting that the present will change as well as the simple message that every act has a consequence; especially childish and ignorant acts at that. And even if such themes does not interest you, I think this beautiful story is well worth spending one and a half hour of your life watching. Hands down the best movie (animated or otherwise) I've seen in at least five years. Although the character art is simple, I love it &lt;i&gt;because&lt;/i&gt; it is simple and clean. The backgrounds, environment, and special effects are a different thing entirely. They are rendered in such gloriously realistic detail. The landscapes, the classrooms, the streets -- I have never seen such detail in an animated film. It makes things like Beowulf and Final Fantasy: Advent Children look really silly. The characters are also very well-written, complemented by good voice actors. Chiaki's has a tendency to mumble so much, I can barely understand him sometimes, but it actually fits his character well. They're quite convincing as high-schoolers, though, and I love how they were all created so realistically, without following any staple formulae or types. They're all just...normal, even though two of them can do very abnormal things. Though the plot itself is very simple, the way the characters develop throughout the seemingly minor conflicts (and that big, heart-pounding one toward the end) gives the story incredible depth. And when it reached the ending, I didn't want it to end but, at the same time, I felt the ending was perfect. I'm a sucker for this type of ending: very, very hanging. Like most of the novels and movies and anime I like, the movie ends just when another story is about to start -- the rest of Konno Makoto's life. I mean, the movie is set within two or three days, I think, though with the time leaps it may feel like it takes place for a much longer period of time. Those days are when Makoto is merely poised at the threshhold: summer is drawing near, school is almost out, and they have to decide on their majors. Yet what happens in that short time is so profound that I'm sure it will affect the rest of her life. Toki wo Kakeru Shoujo also drives home a message. The line &quot;time waits for no one&quot; is mentioned several times during the course of the film, and by the end it makes sense why the writer chose that line. That there is no time like the present seems like such a cliche, but when we can't leap through time and change events to suit us, the present is all the time we have. We have to cherish each day as it comes and each person as they are, for how do we know that by tomorrow they won't be gone? Whereas I had watched the movie because of its high recommendations, I was disappointed to find out that Toki wo Kakeru Shoujo is very lacking in many regards, in my opinion. I didn't really understand the sudden hollowness we find from Chiaki's character at the end of the movie. His motivation to return to the future was very foolish, in my opinion, and lacked any true explanation for it. What was he going back to if he was losing what seemed to be something extremely precious in the present? I felt his going back was simply a badly used plot device to &quot;change&quot; the main character and their coming together would have achieved that same sort of thing much better. I suppose you can make your own conclusions about that. Continuing on, I felt that whereas the story seemed somewhat mediocre, the art in this movie was pretty special. Featuring what seems to be simple character work, yet extremely detailed environments, you begin to feel sort of immersed into the characters because of discerning features, particularly of their personality, rather than by simply their appearances alone. I actually felt the artwork was very easy to watch and very crisp and clear. The sound utilized in this movie was pretty good. Character sounds were clear and distinct and there weren't any parts of the movie where I felt that the music interfered, but neither were there any parts where I felt the opposite. In respect to the characters, I believe that they were very fleshed out in general and that all of the facets we see of them were very intriguing. However, the character development is what made me decrease this score so. I felt that the development that was apparently supposed to be experienced by Makoto was badly done, and that the conclusion failed to really deliver to me the realism or achievement that was done on her and her character's behalf. Overall, I enjoyed the first hour or so of this movie immensely because of its fresh and interesting approach and delivery. The last bit, however, disappointed me and made the story and everything else feel... incomplete and not satisfying. Tsutsui Yasutaka is a pretty prolific author. He's known for science fiction works featuring dark humour and satire. His most famous work is probably The Girl Who Leapt Through Time. It was first published in 1967 and has been adapted or given sequels several times for live action dramas, films, a manga and an anime film from our old friends at Madhouse. The anime film is a loose sequel rather than a direct adaptation. The big question, is it any good? Our protagonist, Makoto, is having a bad day. She woke up late. She flunked a quiz. She got into an accident while trying to cook tempura, another student was tossed into her, sandwiching her between two other students for a while and she heard strange sounds when turning in some questionnaires only to find no one in the next room. Things take their worst turn when her bike's brakes fail and she's tossed in front of an oncoming train. That's when she finds herself back in the past a couple minutes before the accident. Her aunt tells her that it was a time leap, but Makoto doesn't believe such a thing is possible until, after some experimentation, she discovers how it works. She puts on a cricket uniform with celery in the lapel and leaps through time and space in search of adventure. Actually, she uses her new found power to do better on tests, perform better at baseball, have fun and, most importantly, avoid slightly awkward situations. Yeah, our protagonist is neither smart nor creative. At first, she's having a lot of fun but then she learns that her actions are having consequences, as actions are liable to have. Yeah, about half the film is made up of Makoto using her powers to mess around in relatively innocuous ways and the other half is comprised of her trying to fix things that go wrong. Honestly, it's pretty boring. You keep expecting something interesting to happen with it, but it never does. There is one genuinely dramatic moment, but it doesn't even last ten minutes. The main romance is kind of stupid and doesn't make a whole lot of sense given the circumstances presented. Our cast is bland. Really, really bland. None of them are particularly interesting, but none of them are obnoxious or terrible characters either. There's just nothing that makes them distinguishable from other characters we've seen thousands of times, if not more. Makoto is an idiot who gains a really amazing ability but can't be bothered to think of anything to do with it aside from playing around. Her friends are the generic nice, reliable guy and the generic off-putting guy with a good heart. Then we have all the secondary characters like the supportive friend, the shy girl and so on. The art is really good with nice detailed backgrounds and character designs that, though simple, look good. The time traveling effect is appropriately strange and is also well animated. The voice acting is competent. None of the actors give really exceptional performances, but none of them do badly either. They all do decently. The music is also okay. It doesn't really stand out in the slightest either positively or negatively. There is no ho-yay in this. 1/10. 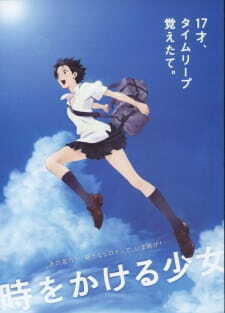 The Girl who Leapt through time is a hard film to discuss. Not because it's complicated but because it's tedious and generic. It's a story about time travel where the time travel is never used in either an interesting or a creative way. It's like a mystery story where the detective solves minor mysteries that don't really have any impact. Sure, you can do it but you're going to have to have really strong characters to pull it off. Not the rather generic cast you get in this. That being said, there's nothing really wrong with the film. In the end my rating is going to be a 5/10. It's average. If the concept of a girl traveling through time to make her everyday life better appeals to you, check it out. If you want something more compelling out of your time travel stories, stick to Steins;Gate, Back to the Future, The Time Machine, or any number of other stories. Tomorrow, film festival week ends with a look at a certain film involving cyborgs.